On this week's show we focus on the recovery on dairy farms after Storm Emma. 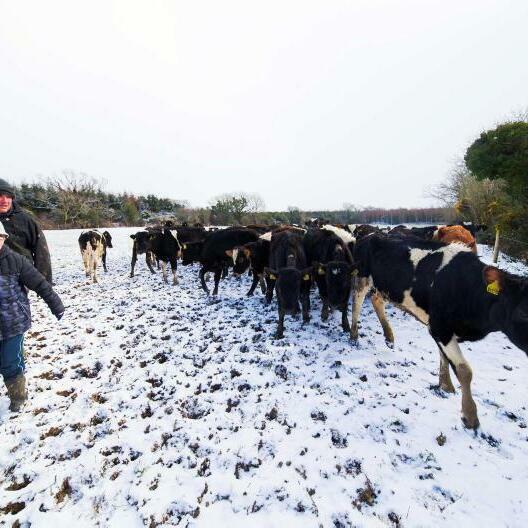 Aidan Lawless, farm manager from Teagasc Johnstown Castle, explains how they are coping with the heavy snow. Aidan gives an insight into the change in diet of the spring and autumn calving cows in the last week, with the spring calving cows shifting from a grazed grass and concentrate diet to silage and concentrate indoors. He also mentioned the implications of rehousing cows, such as cases of mastitis. Joe Kelleher, dairy advisor from Newcastle West, gives advice on how to manage the dairy cow and grassland as conditions remains challenging on a lot of farms in the aftermath of the storm. Where cows are housed Joe emphasises the importance of practices to maintain high milk quality; keeping cubicles scrapped and limed, and stripping teats prior to milking. Joe recommends getting out with nitrogen to drive grass growth, Urea between now and St Patrick's Day and 18-6-12 from then on to provide a source of phosphorus and potassium to the growing grass plant.